Give Maybole The Date For The ByPass! Atkins was requested in April 2004 to undertake a study of transport problems on the A77 on the section through the town of Maybole in South Ayrshire. 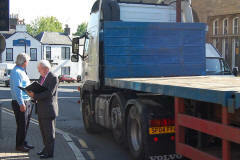 It was agreed that residents in Maybole would be consulted on the existing situation in respect of the trunk road in Maybole. This report summarises the main findings of the surveys undertaken. "The A77 Trunk Road through Maybole - South Ayrshire Council's Proposals March 2005" has been prepared and submitted to Atkins for consideration. The town's people have been continuously and relentlessly campaigned to groups, council, ministers and the government to request the development and construction of a bypass for the A77 around the town. The bypass committee have been running a campaign for many many years. The committee have recently received the confirmation from the current Scottish government minister for transport that Maybole WILL indeed get a bypass. The timescales have however not been made known. We urge all users of the A77 trunk road to support the campaign to announce a date for the construction and development of the bypass to begin. 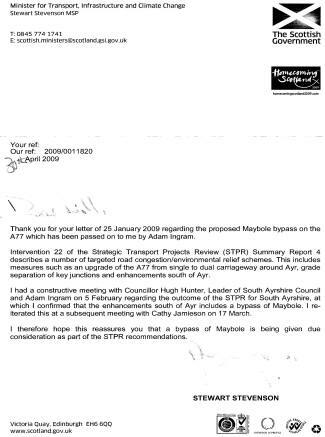 Copy of the letter received by the Maybole Bypass Committee from the current Scottish government minister for transport below. Click to view the letter. Copyright © 2011 by Maybole Bypass Committee. All rights reserved.